We have a love-hate relationship with the sun. On the one hand, the sun’s UV rays make the earth warm enough to allow us to get outdoors to enjoy the sunshine, and to achieve that sun-kissed glow each summer. On the other hand, overexposure to the sun has been linked to skin cancer and other health issues such as eye problems, weakened immune systems, age spots, wrinkles and leathery skin. 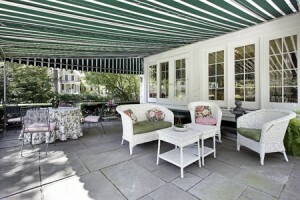 A great way to both enjoy the sun and protect your skin is through the use of an awning. Awnings can offer much-needed protection from the sun while allowing you to still enjoy the nice weather offered outdoors in the summertime. According to Federal Occupational Health, a division of the Department of Health & Human Services, there are many ways to protect your skin from the sun’s UVA and UVA rays, including wearing proper clothing and wearing – and reapplying! – sunscreen. A few other ways to protect your skin include avoiding sunburns and staying out of the sun. Awnings offer the necessary shade to keep your skin out of the sun and in a safe place. Staying out of the sun during the peak burning hours – is between 10 a.m. and 4 p.m. – is recommended. However, this blocks off the better part of the day! Sitting under an awning, though, allows you to still enjoy your time outdoors regardless of the hour by giving you the perfect place to sit in the shade. Avoiding sunburns is the best way to decrease your risk of health problems like skin cancer, and the best way to avoid sunburn is to stay out of the sun, of course. Sitting under an awning offers a wonderful spot for the whole family to share, protected from the harmful UVA and UVA rays of the sun. One of the great things about owning an awning is the option you have in terms of style and coverage. At JM Finley, you can choose to have a permanent awning installed or opt for a retractable awning, which allows you to decide how much sun or shade you want at a given time. This July, in honor of National UV Safety month, practice safe sun habits by gathering the family up under your new awning – your family and skin will thank you! To learn more about having a new awning installed, give us a call today at 610-505-5907.